The Deputy Vice-Chancellor and staff from across the University identified opportunities for future collaboration with the University of Pretoria. 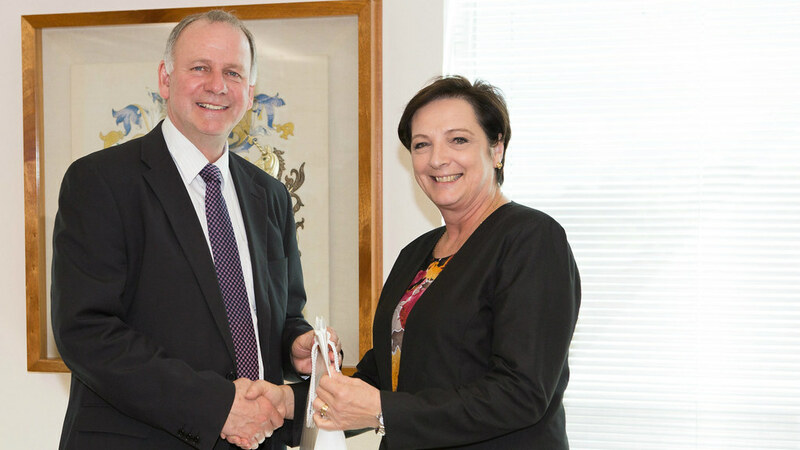 Deputy Vice-Chancellor and Provost, Professor Bernie Morley, warmly welcomed Professor Stephanie Burton, Vice-President of the University of Pretoria, to the University last week. Professor Burton, was attending the British Council’s Going Global Conference in London, took the opportunity to visit Bath to build on the initial discussions held with the Vice-Chancellor during a delegation to South Africa in December 2015. Professor Burton, an eminent biochemist who has responsibility for Research and Postgraduate Education, joined Professor Bernie Morley, Professor Jonathon Knight (Pro-Vice-Chancellor, Research) and Caroline Dangerfield (International Relations Manager) to discuss postdoctoral training and online provision. As chair of a national committee reviewing the current model of postgraduate training in South Africa, Professor Burton was interested to hear more on the cohort-based PhD training developed at Bath. There is a keen appetite for doctoral training in South Africa and for reform of the current system. Professor Burton also met with subject specialists from the faculties of Science, Engineering & Design and Humanities & Social Sciences. Professor James Bilzon, Head of Department for Health, chaired a lively discussion exploring the considerable potential for future collaboration with researchers from across the University. The attendees agreed on actions to accelerate collaborative activities and a cross-university delegation to Pretoria is being planned. Professor Bernie Morley commented: “The University has established strong relationships in South Africa through our strategic partnership with Stellenbosch University and our DBA initiative with the South African government.